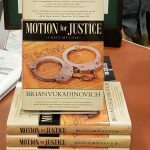 The long-awaited first book from Brian Vukadinovich — Motion for Justice: I Rest My Case — is now available at fine bookstores everywhere. It chronicles his long fight with the U.S. justice system and shines a new light on the biases, unfairness and corrupt motivations of the nation’s courts. It’s a wake-up call for anyone seeking justice in the courts.